HOME > REVENUE AREA > How can I setup gift vouchers? The Hotel can setup gift vouchers, that will be displayed in the booking engine to the guests after the reservation is completed. This will ensure that up selling or cross-selling does not distract the guest to select and book a room at your hotel. STEP 1: To create a gift voucher, please access to REVENUE tab and from the left navigation menu select the option VOUCHERS > VOUCHERS ACTIVE. NOTE: On the left navigation menu you can filter vouchers according to it's status: ACTIVE, INACTIVE or ALL. Note: You can select from the available options, or create a CUSTOM VOUCHER, according to the specific details you wish to use. Visible in booking gadget - this option will allow you to sell vouchers as an add, after the reservation is made. Note: If the Hotel has a website with GuestCentric, the voucher can be also available to book in the page "Products" and can be bought without making a room reservation. When selecting a Monetary Voucher, in the example above, the voucher can be sold for the minimum price of 20 and the maximum value of 200. Therefore, it can be sold for 20, 40, 60, 80, 100, 120, 140, 160, 180 and 200. STEP 4: Add an image by clicking in add media (Images). STEP 5: Add an image that will be displayed at the top of the voucher - PDF (Header Image). STEP 6: To save this voucher, click on . 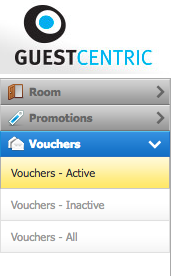 On the website - if the Hotel has a website with GuestCentric and if the page "Products" is active it will display the Vouchers list. 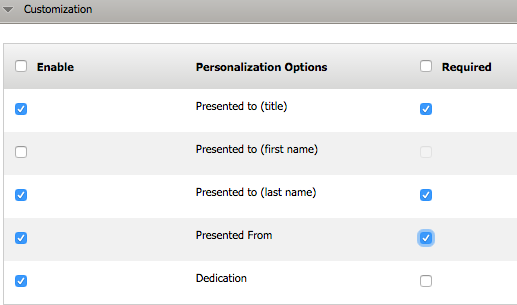 STEP 7: Publish your changes, under the WEBSITE tab. How does this vouchers will appear on the booking engine, after making a reservation? Vouchers and add-ons will be presented after the guest has committed to the reservation, ensuring that up selling or cross-selling does not distract the guest from the main task at hand – selecting and booking a room at your hotel. 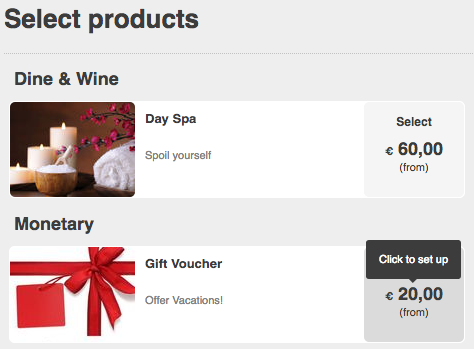 How does this vouchers will appear on the booking engine, when selecting them in the page "Products"? How does the example with "Flexible Price" will be presented on the booking engine? You can order the vouchers appearance on your booking engine just by clicking on . 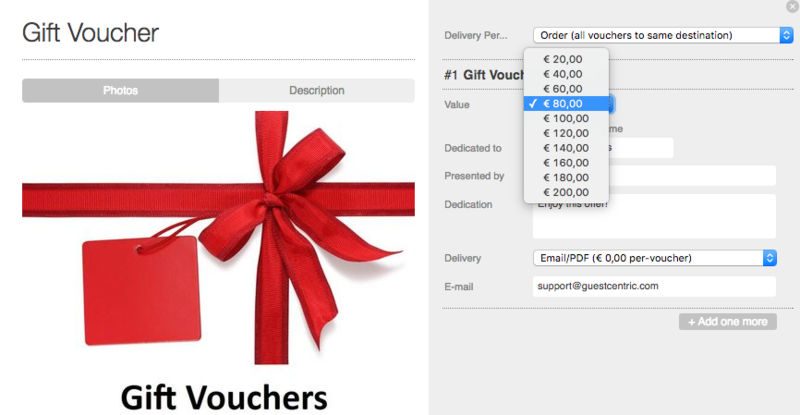 On the next screen order the position of the vouchers, by moving the arrows up and down accordingly and click on SAVE. Where can I see the vouchers information on the backend? STEP 2 : An email notification will be sent to the person who buys the voucher, but also to the person you want to offer the voucher to. For this you need to select the option "delivery" - Email/PDF on the booking engine. STEP 3 : Once the voucher is confirmed by the hotel, after the guest uses it you can mark the voucher as , so the hotel can control which vouchers were used already. - For hotels with payment gateway available, if guest selects this payment method when booking the voucher this will be received as pending payment on the backend until the hotel confirms the payment.